There are numerous ferry crossings operating from Aegadian Islands to Sicily. Ferries currently connect 3 ports in Aegadian Islands with 2 ports in Sicily. There are a combined number of 42 ferry crossings each day across a selection of 6 Ferry Routes which are operated by 1 ferry company including Liberty Lines Fast Ferries with the shortest crossing taking around 25 minutes (Levanzo to Trapani). This is a general summary of the services on offer between Aegadian Islands and Sicily, for live information select from our Fare Search. The Aegadian Islands or Egadi Islands as they are known locally are an archipelago of small mountainous islands in the Mediterranean Sea, off the Northwest coast of Sicily in Italy covering a total area of around 38 square kilometres. 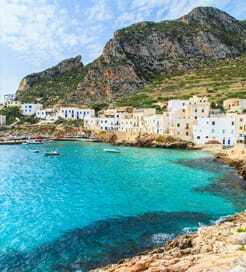 The Aegadian island group comprises of Favignana (the main island and also the largest and busiest), Levanzo (small and quiet) and Marettimo (the furtherst island from the mainland), as well as the minor islands of Formica and Maraone found between Levanzo and mainland Italy. This archipelago is a land of wonders and due to a very low population and desirable Mediterranean climate, the Aegadian group is a perfect location for those who love peace and quiet and uncontaminated nature. With one of the most beautiful sea-beds in the world and an abundance of multi-coloured fauna and flora, the Islands of the Aegadian Island group will no doubt take your breath away. 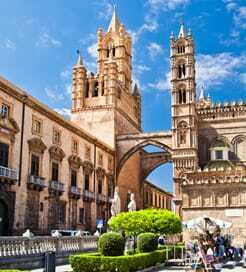 Getting away from the Aegadian Islands by ferry requires travelling to Sicily or the mainland, depending on time of year.